Find out what you need to fully connect your home or office wired or wirelessly with an efficient and customized network before you make a purchase. We’ll conduct an onsite visit, survey your networking needs, and then help you draft a cost-effective plan of action for networking your computers, printers and game systems. 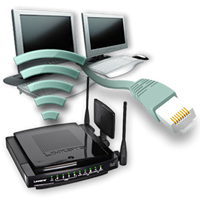 We’ll even help you plan a “mixed network,” linking PCs and Macs for optimal performance. We’ll develop a user-friendly plan for you to share Internet, Printers, and Files from anywhere in your home or office with a verifiably secure wireless network or a hardwired solution.